Free Butane Gas Lighter at Valu Home Centers! 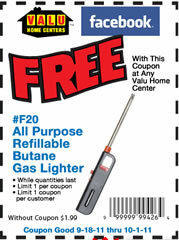 Bring this coupon to your local Value Home Center to score a free All Purpose Butane Gas Lighter! Coupon expires 6/30/12.